While I have traveled internationally before (Qatar and the UAE most recently) this was my first trip to France where I would be immersed in the French language. Growing up I took multiple years of Spanish in high school, even continuing that learning into college. However, the most contact I've had with the French language has been through hearing my daughters learn how to count to 10 in pre-school. The anxiety I felt before my trip is similar to the anxiety that many parents feel when they encounter our schools. According to the United States Census Bureau there are over 350 distinctive languages spoken within US states and territories. In many of the districts I work with they have anywhere from a few to over 100 different languages spoken. This can make the most basics of communications tricky to impossible. Some larger, urban districts have special offices that offer translation services but for the vast majority of schools, districts and faculty, translation and language communication are left to just figuring it out. While there are a number of apps and services (some inexpensive to very costly) available, they all seem to fall short. Many of the most popular text based translation services rely on wonky machine learning to provide translations and they are far from perfect. Even less of them offer real-time translation services or are only available through apps. And even less of those allow for images to be taken of text to be translated on screen. Not only does Microsoft Translator do all this, there is so much more it can do, and all for free! Available as a customizable web-based room, app and built into Windows 10, Microsoft Translator offers the most languages and features in one, free package than any other service out there. I decided to try it out on my trip to Paris to see if it was really as robust as advertised. I loaded the app on my iPhone and as soon as I landed I felt comfortable with the language. The app has 4 features I found myself using all the time. Real-Time Translation-Using the built in mic on my phone I could speak a phrase in English and have it translated to any of a number of different languages, along with the text translation in seconds. This allowed me to get a taxi, buy a metro ticket and order meals with wait staff with ease. The Real-Time Translation can listen for any of 22 languages and translate in to over 60 languages, again as text and audio. Type To Translate-Using the same languages as Real-Time translation you can use your keyboard to type words or phrases and see the translation. This was handy for quick words I wanted to know the meaning of or phrases I needed to remember. Image Translation-By far the most useful feature was the picture translation. Simply point your camera at a piece of text and the app will translate the words it sees to your chosen language. This was great for museums, menus or other signs I encountered. Also, when working with the global educators I could take pictures of projects and lesson plans simply and easily to read. Even after you take the picture and translate the text you can re-translate to another language without having to take a new picture. This was extremely helpful for the projects presented as many of them where not in my native language. Conversations-The app also has the ability to create a private room where you can carry out a real-time conversation with others using both text and audio. Create the room, share the code or scan the QR code and you're talking in no time. When I was talking with some educators from Indonesia, Japan and Brazil we quickly fired up a room and talked for a while in our native languages. This made things much smoother and more comfortable for everyone. And users don't have to be in the same place. The virtual rooms work anywhere there is an Internet connection. The app has other features as well like a phrasebook giving you quick access to the most common phrases in multiple languages. Directions, Dinning, Time and Numbers, Health and Emergency are just a few of the categories. Mark your favorites for quick access. Via the web the same virtual conversation room can be used to do real-time text and audio translations for presentations or meetings. I made sure to ask everyone I used the app with how the translations were. All agreed they were very good. With any machine-learned translation service there were some gaps, more so with text based translations but all said the audio or spoken translations were flawless. But what about for schools? This could be huge for regular interactions, meetings or conferences. There is no reason why everyone in a school couldn't have the Microsoft Translator app on their mobile device and use it whenever someone comes into the school and doesn't speak English. Creating an inclusive environment is key for parental involvement and engagement. 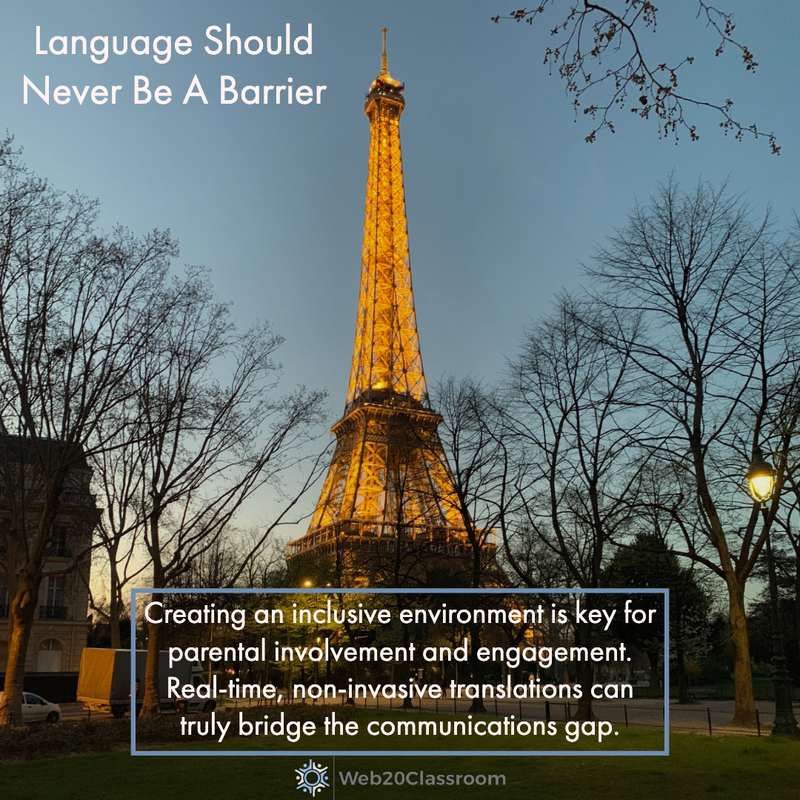 From the day-to-day interactions with the front office to parent meetings to conferences the real-time, non-invasive translations can truly bridge the communications gap. It doesn't have to stop there. Students who are new to a language don't have to feel withdrawn or anxious when in a new environment because they don't speak the language and teachers can make them feel welcome from day one by using the app as well. Want to learn more? Check out the Microsoft Translator website. Also be sure to visit the Translator for Education page to read some amazing stories about how the app is helping schools and districts reach more parents and students and Free Technology For Teachers blogger Richard Byrne has a great video to help you get started.